I'm sure you're asking, "Why should I make egg rolls when I can order them from my local Chinese restaurant and have them delivered in 15 minutes?" Well, I'll admit they are time consuming, but they aren't that difficult and really are delicious. And when you think about it, this recipe makes about 50 egg rolls for the price that you would pay for 6 at the restaurant. That's a pretty good deal if I do say so myself! Plus, you can freeze all the extras and take them out whenever you have a craving and they'll be ready for you in a couple minutes. I served them with soy sauce, teriyaki sauce and sweet and sour sauce. Enjoy! Place about 2 tbsp. of filling in the center. Fold the wrapper up half way. 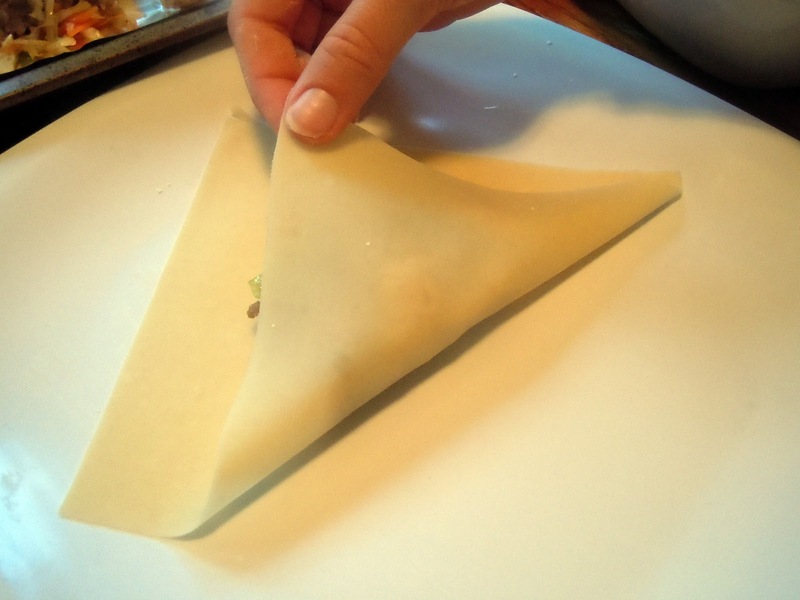 Fold over the right corner. Place the cornstarch slurry on the upper corner. 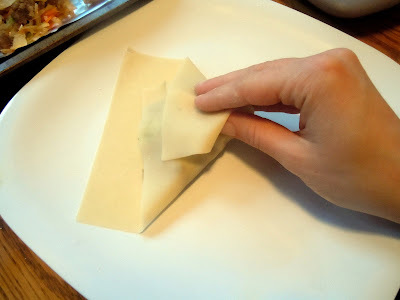 Continue folding the roll upwards and seal the corner with the cornstarch mixture. Marinate the ground pork with the soy sauce, cornstarch, sugar and sesame oil for at least 10 minutes at room temperature. Heat a wok or large frying pan over high heat until hot. Add the cooking oil and swirl to coat. Mix in the garlic and ginger and fry until fragrant, 15-30 seconds. Add the pork and stir fry until no longer pink. Toss in the coleslaw and stir fry for 1 minute, until softened. Add the rice wine (if using), soy sauce, sesame oil, salt and black pepper. Continue to stir fry for another minute. 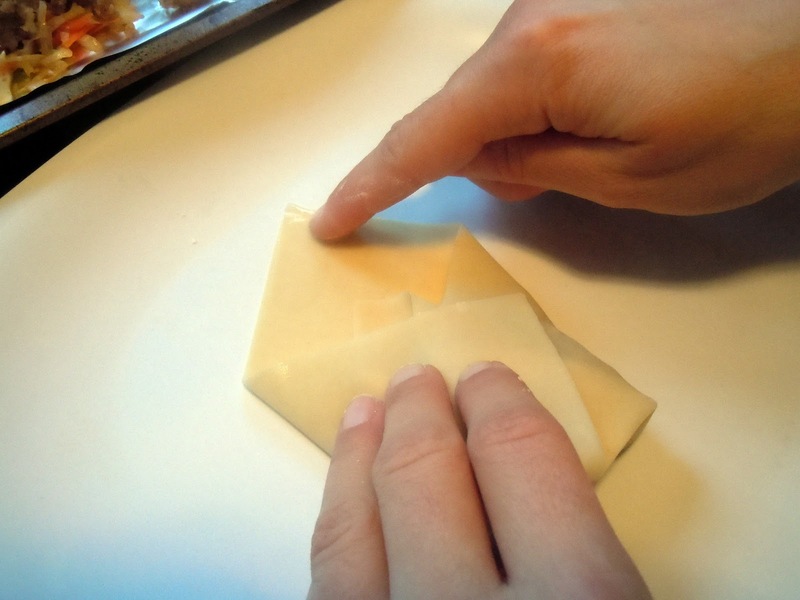 Remove the filling to a baking sheet and spread out to cool. Prop up one end of the baking sheet so that it tilts and will allow all the liquid to drain to the end. Let cool for 15 minutes. Discard all of the accumulated juices. 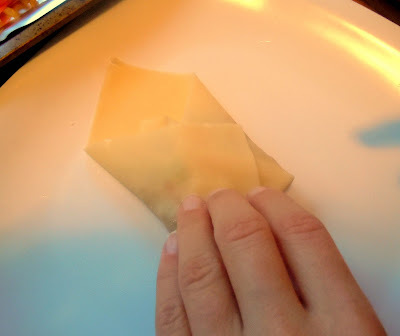 Use paper towels to blot the filling to get rid of extra oil or juice. Place 1 tablespoon of filling on one corner of an egg roll wrapper and wrap each egg roll. Seal with a small amount of cornstarch slurry on the end of the wrapper. Keep the rolled egg rolls in a neat, single layer and cover with plastic wrap to prevent from drying. If you want to stack the egg rolls, make sure you have a layer of parchment paper in between the layers to prevent them from sticking. Refrigerate up to 4 hours until ready to fry or freeze. 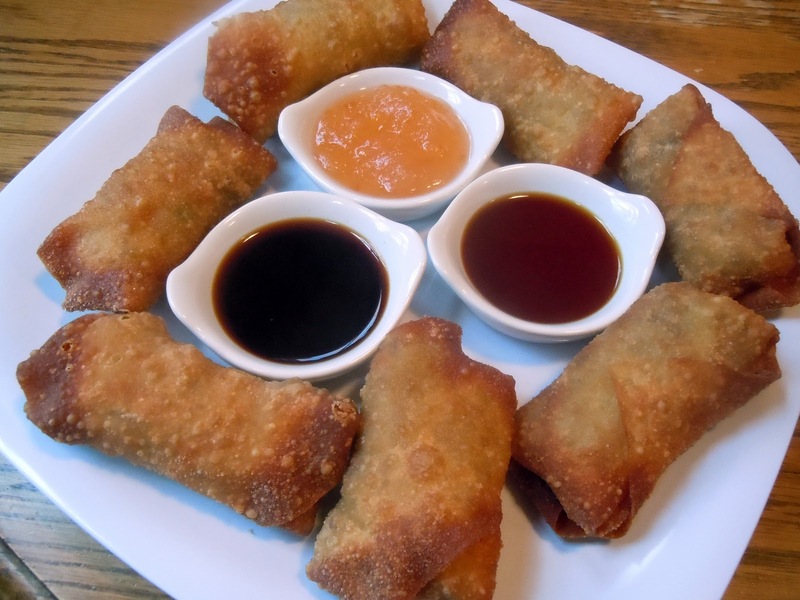 To fry the egg rolls, fill a wok or pot with 2 inches of high-heat cooking oil. Heat the oil to 350 degrees F or until a cube of bread will fry to golden brown within 10 seconds. 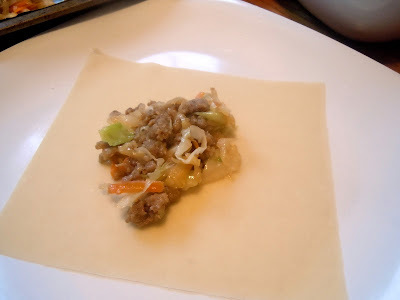 Gently slide in or lower the egg rolls, frying 4-6 at a time, turning occasionally until golden brown, about 1 1/2 minutes. Place on wire rack to drain and cool. To fry frozen egg rolls, do not defrost first. Just add them to the oil frozen, frying 4-6 at a time. Add an additional 1 1/2 minutes to the frying time since they are frozen. 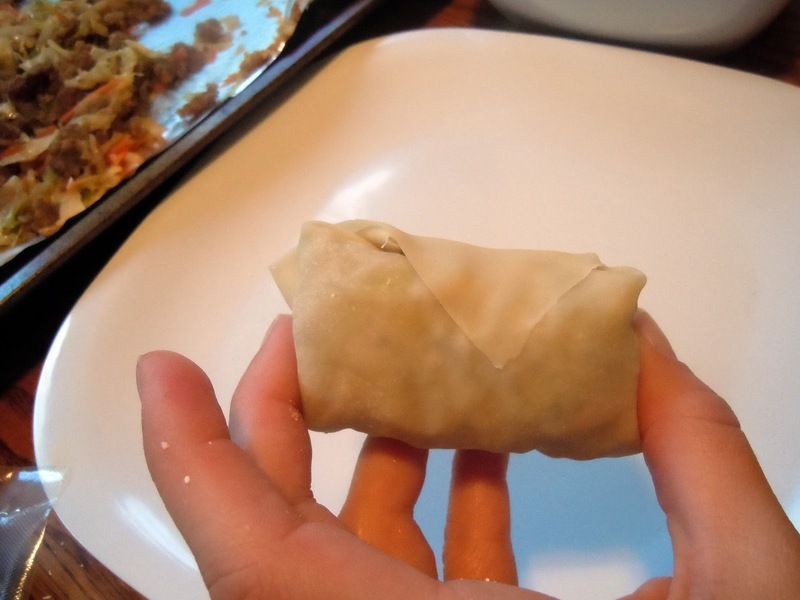 Re-heating Egg Rolls: Place in an oven at 375 degrees F for 5-8 minutes.